Orion's dogs have no stories told specifically about them. The true interest lies in the star Sirius, the dog's nose, and the brightest star in the sky. Called the Dog Star, it heralded the "dog days of August" because roughly 1000 years ago it rose shortly before the sun at the start of August. People believed the combined light of Sirius and the sun caused hot weather. Today, one would have to wait until late August or early September for the Sun and Sirius to line up like that. That shift in dates is caused by a phenomenon called precession, a 26,000 year circular wobble of the Earth as it rotates. Go further back in time (about 3000 B.C.E.) and Sirius rises just before the sun in early Summer. The ancient Egyptians used the predawn rising of Sirius (called the heliacal rising) to predict the flooding of the Nile. 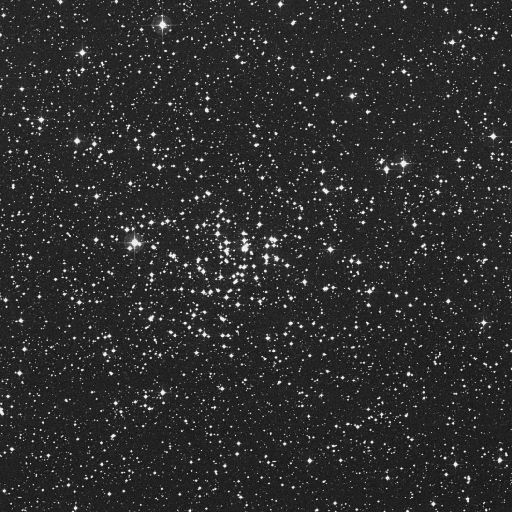 87k JPEG Caldwell 64 (NGC2362) is the open cluster designed for all those apochromatic refractors. 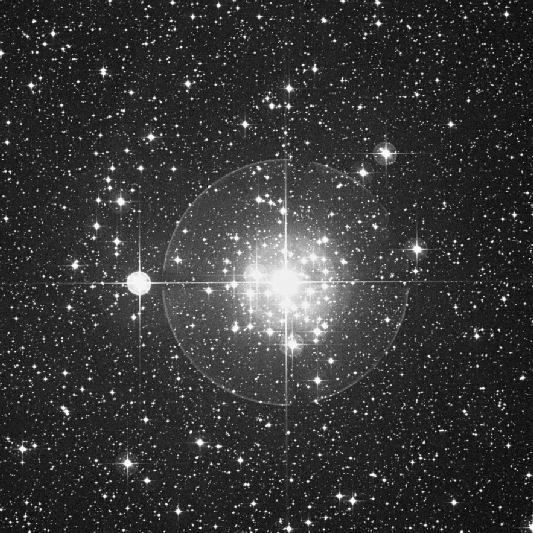 Centered on Tau Canis Majoris, the cluster is an exquisite jewel that rewards clean, high contrast optics. Dreyer calls this mag. 4.1 cluster fairly large (8'), and rich, with about 60 stars at mags. 4-13. Image from "Le super NGC Catalogue!" Image has the look of a Digital Sky Survey download. 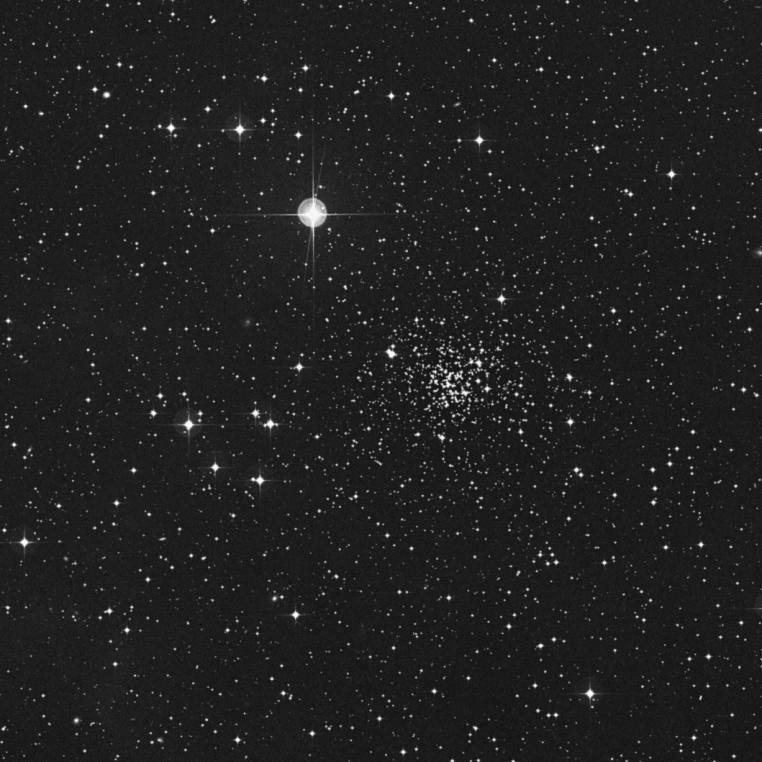 87k JPEG Caldwell 58 (NGC2360) is one of many lovely open clusters in Canis Major. Located 3.4° east of Gamma Canis Majoris, Dreyer calls this mag. 4.1 cluster very large (13'), fairly condensed, and rich, with about 80 stars at mags. 9-12. Image from "Le super NGC Catalogue!" Image has the look of a Digital Sky Survey download. 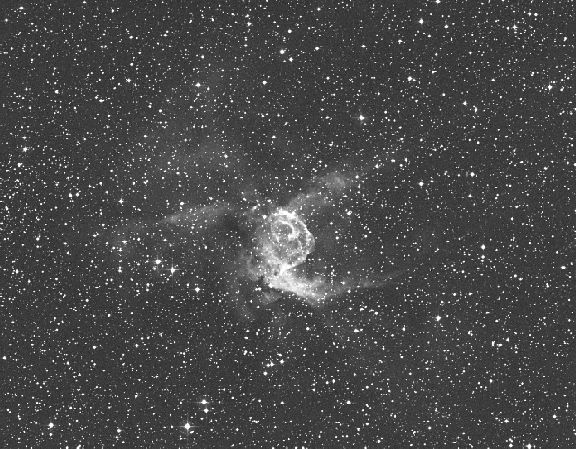 NGC2359 (Best 25), sometimes called the Duck Nebula, or Thor's Helmet, is one of Dreyer's very remarkable objects. Located 4.3° northeast of Gamma Canis Majoris. 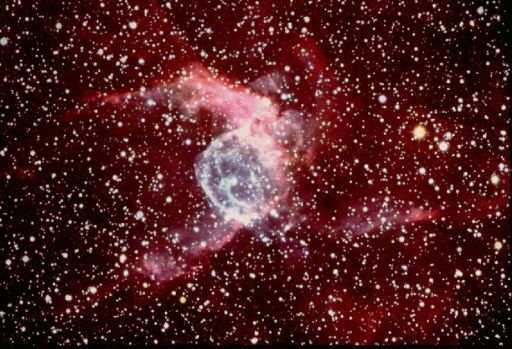 Dreyer calls this nebula very faint, very, very large (8'), with curving filaments. An 8" with a nebula filter helps. The central mag. 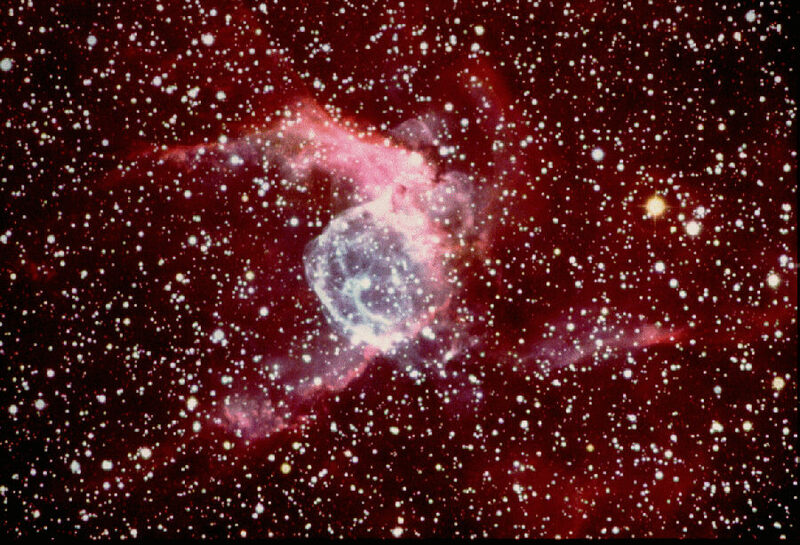 11 star is a Wolf-Rayet. These are stars several times the size of the sun, and thousands of times more luminous. They are also either extremely turbulent, or throwing off masses of material. Image on the left from the Anglo-Australian Telescope, by way of the Deep Sky Corner. Image on the right is from the Digital Sky Survey. 98k JPEG M41 (NGC2287) is a lovely open cluster located 4° south of Sirius. Dreyer calls it very large (38'), bright (mag. 4.5), fairly uncondensed, with plenty of stars at mag. 8 and fainter. This is a superb cluster, with stars of contrasting colors. Image from the Digital Sky Survey. 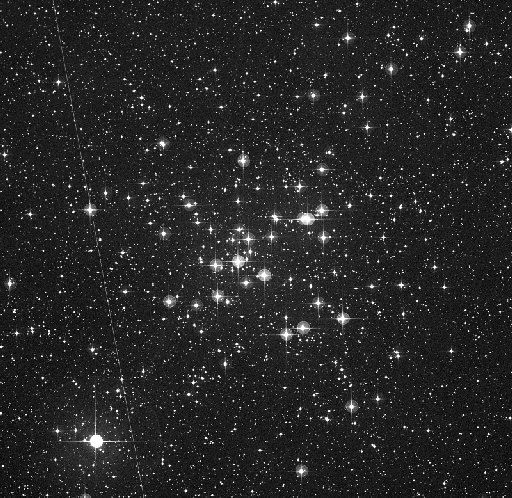 75k JPEG NGC2243 (Bennett 36a) is an open cluster located in south-eastern Canis Major, 1.3° NNW of Lambda Canis Majoris. Dreyer calls this a fairly faint cluster of mag. 9-11 stars. Telescopes over 12" may see over 100 stars. Small telescopes (3"), or poor conditions will show only one to two stars embedded in a faint haze.